The killing of ten wolves by a single hunter north of the Denali Highway, has raised new calls for protection of the animals in the Denali National Park region. Photos of an unidentified hunter with an AR-style rifle and a snow machine, surrounded by ten wolf carcasses have circulated online. 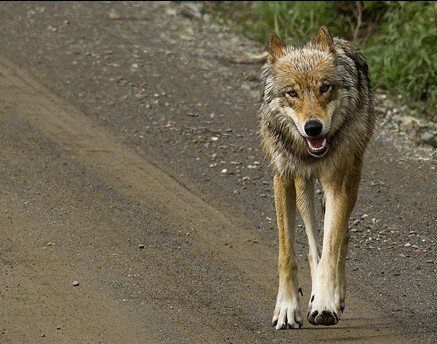 State Division of Wildlife Conservation Director Bruce Dale says the state was alerted to the February kill, which occurred on state land 70 miles east of the park, where the wolf hunting bag limit is ten. Biologist and wildlife advocate Rick Steiner says the mass killing of wolves and other predators has no place in modern Alaska. Some online comments applaud the wolf kill as a benefit to moose and caribou, and the state’s Dale defends the high bag limit for wolves, citing the species resiliency. ”A pack of six can double in size with a single litter,” Dale said. Dale says kills by other wolves or people disrupt packs, but also result in dispersal that leads to formation of new family groups. The ten-wolf kill occurred far from an area along Denali’s northeastern boundary, recently closed to wolf harvest due to an above average take this season.